Electrical Stimulation - Pamela Morrison Pelvic Pain Physical Therapist, P.C. Electrical Stimulation - Pamela Morrison Pelvic Pain Physical Therapist, P.C. 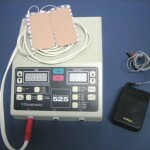 Electrical stimulation is a modality which uses electrical current to stimulate a muscle contraction. By using various settings, it can treat muscle weakness, pain, and swelling. Muscles that have a nerve supply (are innervated) can be strengthened and the stimulation can prevent or reverse disuse atrophy, improve mobility, promote circulation, and prevent fibrotic changes. Disuse atrophy is commonly seen after sports injuries and after times of immobility. By placing electrode pads on the skin over the targeted muscle, specific muscle fibers can be recruited. Treatment time can vary between 10 to 20 minutes and can be used in combination with prescribed exercise or application of heat or ice. Your therapist will prescribe the appropriate protocol to speed up your recovery. Interferential electrical stimulation, a deeper penetrating stimulation, is very effective for treating pelvic pain issues such as interstitial cystitis, chronic pelvic pain syndrome, prostatitis, and low back pain. TENS (transcutaneous electrical nerve stimulation) is a portable black unit which stimulates the nerve to block pain signals. Electrodes are placed on the skin at the painful site. This unit is battery powered and can be used at home or work for chronic pain problems. Instruction by your physical therapist is necessary for independent use. Specific placement and settings have been shown to help with bladder frequency and urgency, coccyx pain, and vulvodynia.